The war in Afghanistan is not about the hunt for Osama bin Laden or the tragic events of September 11--not for the ordinary Afghan. For most, it is their chance for a redistribution of power, and therefore, wealth. The women know of decades of conflict in their bodies; they live with terror stamped in their hearts and mourn their dead husbands in the hunger of their bellies. The boys have known nothing but war; they have grown up to become soldiers, both bloody-minded and frightened. So they fight, not the righteous fight of a Muslim in Jihad, but the unholy fight where the preciousness of life is ignored, the gun is law and the ultimate prize is control. At the front lines near Boreda village, Northern Alliance fighter Mohibullah Madi watches as Taliban soldiers surrender before an attack on Khanabad and Konduz, the last Taliban-controlled towns in northern Afghanistan. © 2001 Cheryl Diaz Meyer. All Rights Reserved. Northern Alliance tanker Abduwali cheers his fellow mujahedeen as they prepare to take Khanabad and Konduz in northern Afghanistan. Only partially exposing her face, Momo Juma begs from men as they leave Friday morning prayers at Jamay Mosque in Khoja Bahauddin, a Northern Alliance stronghold in northern Afghanistan. Internally-displaced women have little opportunity to work and simply hope for men's generosity in the war-ravaged country. 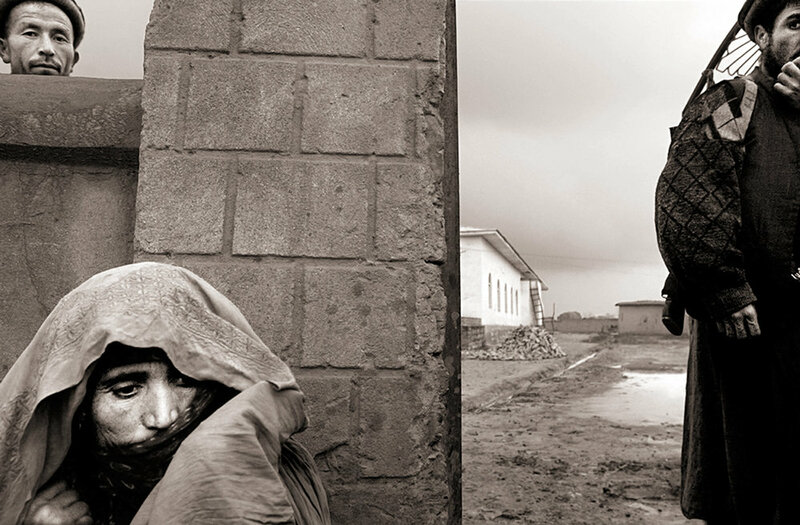 Jumakhon Dilbar seeks help for his amputated leg at a newly-established clinic by Doctors without Borders in the village of Saksakol in northern Afghanistan. Northern Alliance soldiers watch anxiously as some 500 Taliban fighters surrender from Konduz. Mass surrenders kept casualties to a minimum during the takeover of the Taliban stronghold in northern Afghanistan. Kholdana weeps for her two sons who were killed by a rocket and her grandson, Zebullah, who was injured in the attack. The makeshift tent at the Khoja Bahauddin Hospital has been their home for weeks as they wait for Zebullah's foot to heal. Curious crowds of children and adults peek at Esmatullah, a Taliban prisoner who is held captive after the Northern Alliance took over Konduz, a Taliban stronghold in northern Afghanistan. 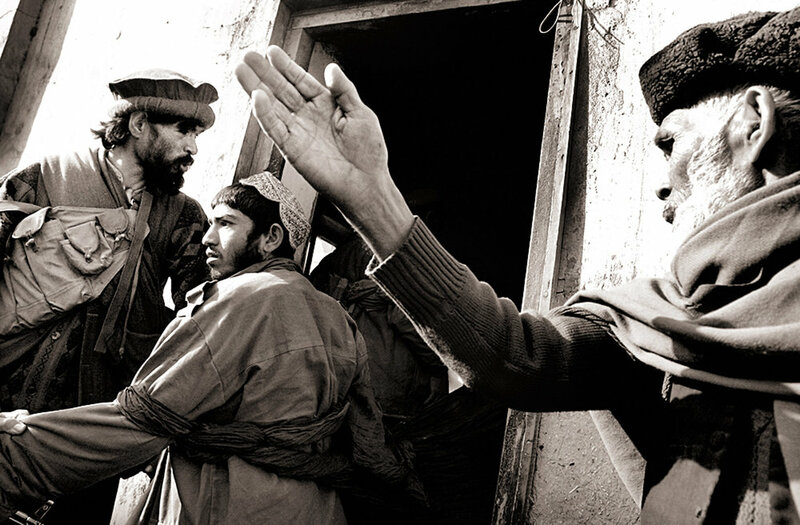 Taliban prisoners are rounded up and tied together with their black turbans, the very symbol of their affiliatiion, as the Northern Alliance takes over Konduz in northern Afghanistan. Declaring their new loyalty by taping a poster on their vehicles of Ahmed Shah Masood, Mohibullah and some 500 other Taliban soldiers from Konduz surrender to the Northern Alliance in northern Afghanistan. Many of the foreign Taliban were unable to surrender and remained in Konduz to put up a last fight. Bismullah Qurban sinks into a corner near a makeshift prayer area in Walwalij, a smuggling port between Taliban and Northern Alliance-controlled territory in northern Afghanistan. Northern Alliance and Taliban commanders greet each other as old friends after a tense surrender of some 500 Taliban soldiers on the Konduz front lines. Negotiations with the Taliban allowed them to keep their vehicles and arms, as long as they surrendered peacefully. Taliban prisoners Esmatullah, Esmatullah and Abdulghafar plead for their lives from the Northern Alliance soldiers after their capture in Konduz, northern Afghanistan. Bodies of alleged Taliban fighters litter the streets of Konduz, Afghanistan, after the Taliban stronghold fell to the Northern Alliance in an early morning skirmish.